One of the things missing from Lion’s full-screen support is a standardized keyboard shortcut for switching modes. Before Lion, it was entirely up to developers to implement the behavior, appearance, and activation mechanisms for entering full-screen mode. Now, we are treated to standard “Enter Full Screen” buttons on qualified windows, and with standard “Enter Full Screen” and “Exit Full Screen” menu items for toggling modes. But there’s still no standardized shortcut. Early in my testing of Lion, I decided to fix this using Apple’s mechanism for redefining keyboard shortcuts of specifically named menu items. For me, Cmd-Ctrl-Return makes a good toggle shortcut for switching any given app or window between regular and full-screen modes. Click the “Keyboard” preference pane. Switch to the “Keyboard Shortcuts” tab. Click the “+” button to add new shortcuts for “Enter Full Screen” and “Exit Full Screen”. I find myself more likely to embrace full-screen mode and switch in and out fluidly when I can do so with a standard keyboard shortcut. Update: Eric Schlegel points out on Twitter that Cmd-Ctrl-F is the “standard” for full-screen mode, but that some Apple apps don’t follow the standard. Perhaps that would be a better choice for this global setting as well. This entry was posted to Lion. Both comments and pings are currently closed. Thanks for reading! Great tip! Keep them coming. They are really useful. 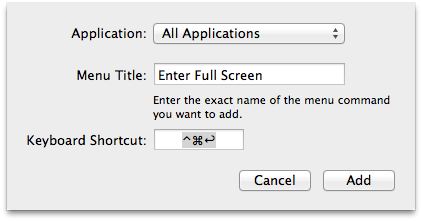 There is in fact a standard shortcut: Command-Control-F. See Menus->The View Menu in the HIG. Safari, Mail, iCal and Xcode use it, but Terminal does not. To exit full screen, ‘esc’ often works too. I’ve tried doing this. The shortcut is set, but only occasionally works. What are the conditions for this to work, because it seems like it only works right after the window gets focus. Set mine as Command + Shift + F so that it is the same shortcut as Firefox Full screen! Wonderful! The most horrible thing is iTunes: It uses the standard CTRL CMD F but als CMD F alone. And there is no “place cursor in search field” anymore. Nice work, Apple. Read your own HIG! Check your facts. It is, and always has been, Option-Command-F to place the cursor in the search field. Yes, you are right. I corrected that shortcut a long time ago, so I totally forgot about the original absurdity. However being consistent here, instead of finally changing that shortcut to comply with their own platform’s standard, was really not the best idea! They even made it worse by assigning two nearly identical shortcuts to the same function, while ignoring their own standards in the process once again (CTRL-CMD-F is the standard shortcut for fullscreen, _not_ CMD-F).